Ma è identico, sei stata bravissima Lilli tra l'altro il look in se è proprio bello! Ciao dolce Lilli ! E'un look che copierò sicuro. Mi piace l'idea della camicia sotto la pelliccia ! Ciao Lilli, proprio bello questo look, complimenti. E' un mix che piace molto anche a me e anch'io ci vedrei un paio di slip-on. Davvero carino questo look. Ma Lily hai ricreato un look praticamente identico! Bellissimo in particolare il pellicciotto. Cara Lilly, hai fatto un lavoro straordinario! Il look mi piace molto: un elemento animalier è perfetto in ogni occasione, oltre che nella moda dà un tocco di eleganza anche in casa. Molto bello questo look, il cappotto è stupendo! quello che mi piace di questo tipo di outfit è la combinazione leggings, camicia in denim e giacca leopardata. Davvero molto carina come combinazione. Uno stile urbano e alla moda. non il pellicciotto, ma perchè in generale non amo la stampa leo, ma mi piace tutto il resto del look, bello! mi piace l'idea di sostituire i deco con le sneakers...rendendo l'outfit stiloso e casual! bello questo look da copiare e poi si può realizzare davvero spendendo pochissimo e acquistando capi versatili che possono essere sfruttati con facilità. Thanks for style for less ideas - love the leopard print coat!! 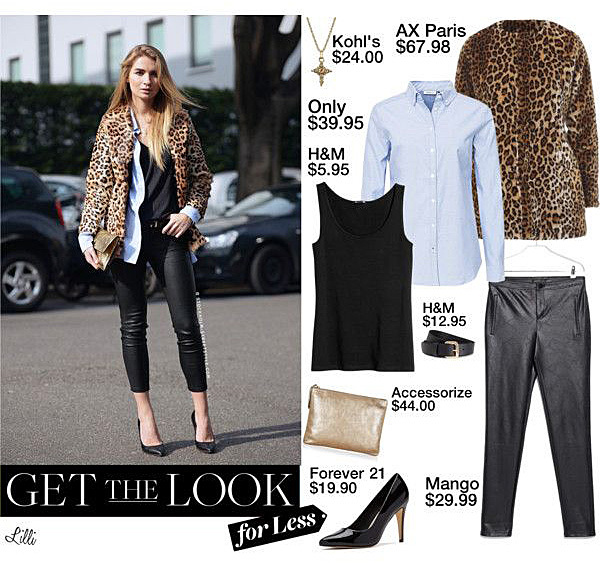 Like the style and adore the leopard coat !!! Wow ,love it how you copy it for lees! Especially the Coat is my favorite Piece! Yay for budget look! This is definitely one of my favourite series from you, Lilli and I love the one that you put together to recreate such a chic and glamorous look. I really miss shopping in H&M, they have such lovely clothes with low price. Maybe I'll start doing some H&M shopping online. This is such outfit Lilli! I really like your picks in recreating the look. You always do a great job with these and you nailed this one as well. I think I'm inspired to war something like this now :) Have a lovely weekend my sweet friend! My kind of look! I love the coat; it's gorgeous. Have a lovely weekend Lilli! Lo indosserei subito questo look e tu lo hai ricreato alla perfezione!!! very nice look:) have a lovely weekend! This outfit does rock! I love that you recreated it with these fantastic pieces for less! I can totally see you wearing it just by swapping out the heels for some cute runners! Great idea! Yes some flat shoes would be perfect this look for your style, I like it! Comfort shoes I chose too. Lilli il pellicciotto è meraviglioso, un'ottima alternativa! ;) Bellissima anche la camicia azzurra, un classico che ancora mi manca (la rubo sempre a mia mamma però ne vorrei una mia!)! :D Bacioni e buon week-end! Che bello questo look! Baci. Wow! I do not know if I dare to wear the coat but she looks great with it! Now I want to come a little cold to the city. Happy weekend Lilli! I like the colour combination of black, gold with a hint of light blue. So chic. This will look great on you Lill. Beautiful coat! Happy weekend, Lilli! awesome outfit! it looks great, totally worth a copy cat for less! thanks for picking out the best affordable alternatives to get the Maria Kolosova street stlye look. Great post dear.=) Love this outfit. I've always marvelled at how you all put all these outfits together. Is it via Polyvore? I love the layers of tank and long sleeves with leopard. Sounds busy but looks well put together. While heels really rock the look, I think I would be more comfy with sneakers too. Hello Lilli, Thank you for your sweet compliment and for sharing your thoughts. I wished I could introduce you to Leslie. Hahaha... You would like him! He has experience in Caucasian's hair too as he has some Caucasian customers as regulars. He once told me that Asian hair and Caucasian hair is so different in texture and reaction to types cut/heat/styling products etc. Even hair in different countries and climates behaves and reacts differently so hairstyles should also take into consideration the surrounding condition too. adoro il nero abbinato agli accessori oro! mi piace molto anche la camicia celeste!